The Journal of Science and Education of North-West Russia is a scientific peer-reviewed electronic edition to publish the results of scientific research. Founder and publisher: Kaliningrad regional branch of the All-Russian public organization «Russian Engineering Academy». The Journal is registered by the Federal Service for Supervision of Communications, Information Technology and Mass Media (certificate El № FS77-63282 of 06.10.2015). The Journal is indexed in the national bibliographic database of scientific publications Russian Science Citation Index RSCI. Publication regularity: once every three months (March, June, September, December). The Journal aims at creating an effective scientific collaboration and communication between Russian engineering and scientific communities, reporting about innovative and scientifically important results of studies and progressive results of their application. – exchange of experience in scientific research, holding scientific conferences, studying teaching methods, and in the development of basic training of scientists, teachers, and engineers. 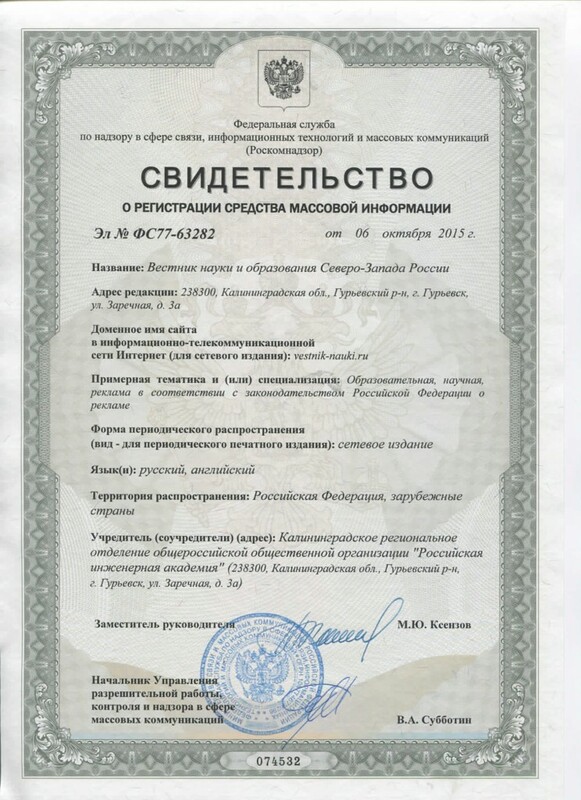 Registration certificate of the Journal of Science and Education of North-West Russia: El № FS77-63282 of 06.10.2015.